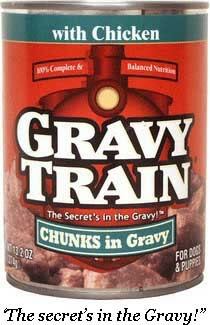 Note: “The Gravy Train” (this post’s unofficial nickname that I came up with just now. Like the photo to the side? I hope no one is hungover this morning. That photo and thinking about the “fragrant” contents inside could surely push you over the edge) will hereby cease linking to the ESPeeoN. I tire of them and their “Low” blows. All aboard the Gravy Train! With biscuit wheels and bacon tracks. Wooo-woooooooooo! Let’s cruise around the Internet and see what we can see (updating through the morning). Next stop! Early shot! 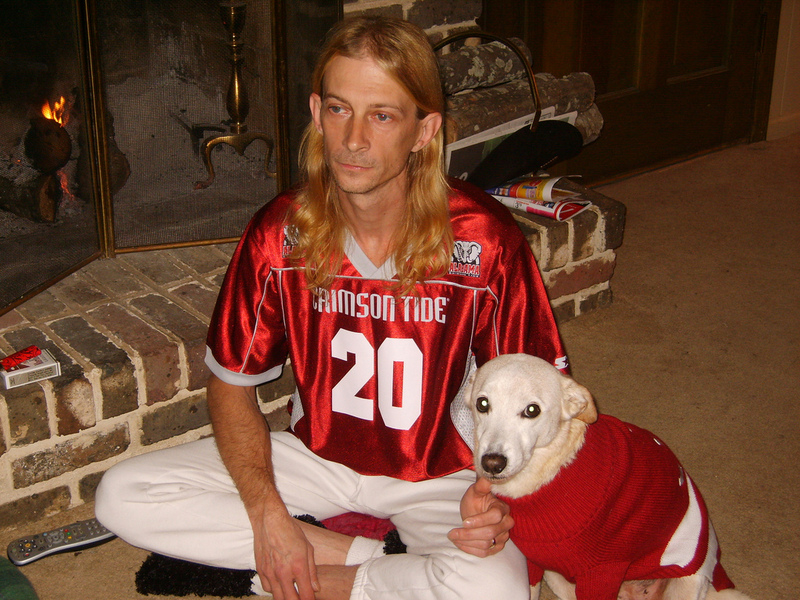 Bama fans and their embarrassed dogs will be watching from home this championship season. (9:40 a.m. CST): I’ll probably be using this photo over and over again. I love it so. Easy pickin’s. Fish in a barrel. Next stop! Quite a “splash” on the AUfficial site this morning. (9 a.m. CST): Wow. 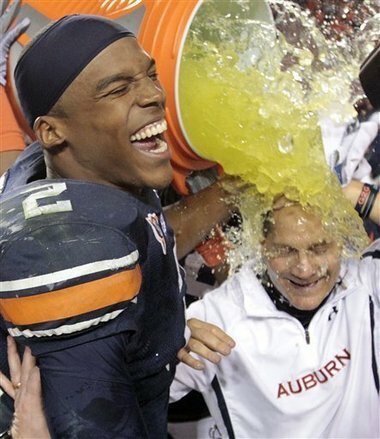 You can’t even see Chizik under that gatorfall. SEC championship ticket info, shirts and whatnot there too. … the biggest obstacle the Tigers face in the next 13 days is the culture that is the SEC — specifically, the state of Alabama. The subject of Newton’s status and who might have broken rules will be pursued the way a dog gnaws on an old soup bone — relentlessly. Despite the fact that we are now a week and a half into this story and there has yet to be any official allegation that Newton or Auburn broke any rules, there will be no relief from the toxic atmosphere that exists in this part of the world at this time of year. The next 13 days are going to be very intense for No. 2 Auburn. “Toxic atmosphere”? Ding! Ding! Ding! You are a winner! Just like pulling off your space helmet and taking a deep breath on Venus. Have your Tums/Pepto/Maalox/etc. at the ready, folks. Maybe this history [the slights of 1957, 1983, 1993 and 2004] is what helps make Auburn special. Tigers fans can wear this as a badge of honor — you can beat them at the polls, but they won’t give so easy on the field. Maybe this helps explain something said the other day by a friend, who loves his Tigers: If Auburn wins a national championship, the NCAA can take away the wins but it can’t take away the feeling. I want the wins and the feeling, thank you very much. This does my heart good. With all that both these guys have been through the past few (it feels like 459) days, they certainly deserve this. I had a horrible feeling creeping up my spine all yesterday morning, before the game and even after the win. I guess it was the way the game ended. We, as fans of the Tigers, have went through the wringer too. I feel better about things this morning. !!! !SEC West Champs!!!! has finally registered. War Eagle! Gravy Train’s first stop! Fairley certain Georgia’s hurtin’ (7:30 a.m. CST): Hey did you hear? Nick Fairley is now official a “dirty player.” Auburn takes cheap shots. I wouldn’t want him any other way. Beloved by us and his Auburn teammates. Hated, despised and feared by all others. But I have to say that the melee near the end turned my stomach. And now Auburn will be paying for it dearly in the first half of the Iron Bowl. Tailback Caleb King said the back-and-forth was going on all game. So spare me the righteous anger that some in the Georgia camp have already displayed about it being all on Fairley and Chizik’s heads (for planting Murray’s head in the soil heh heh heh). So now we have “dirty players” on both sides of the ball. Cheaters, chop blockers and head hunters all of them! For shame. Tsk. Tsk. Tsk. Now if you’ll excuse me, that SEC West crown looks in need of a good polish job. Good lord! Look at the dirt and grime! And it smells like the elephant house at the zoo! Atlanta papers are full of UGA crybabies calling us a dirty team, blah, blah, blah. Want some good Sun am entertainment? Try the Bulldog Brunch (11am est). http://wsbradio.com/. Delusional, whining UGA fans. If anyone at UGA is whining about Murray getting hurt at the end they need to ask Richt: Why was your starting quarterback in the game, down 18 points and taking a seven step drop to throw the ball 50 yards with 2 minutes left? Was UGA going to come back and win? No. So if you don’t want your quarterback to get hurt then run the ball and go get on the bus. They set him back there with a big target on him and then whined about it when we hit the target. Am I the only Auburn fan that is willing to admit that Fairley does have a substantial amount of late hits? The one he was flagged for (when he almost snapped Murrays head off) was inexcusable. I’m not sure about the hit that started the stuff at the end. Yeah, he was “blocked,” but I havent seen Fairley thrown to the ground by anyone all season. Fairley is a beast- he has one thing on his mind- “Get quarterback, plant quarterback.” You’re fooling yourself if you think that he doesn’t go too far sometimes. One thing is for certain. I’d rather have a Fairley that doesnt know when to turn it off, than a lineman who is so nervous about penalties that he never hits anyone. Dirty, passionate, whatever…. glad he’s on our team. Other games this year, it was just playing tough. Yesterday, it really looked like he was out to crush that kid (probably because Murray’s smaller than most of the guys he’s had to tackle the last few weeks). I think the hatred this team has for UGA came out, especially after we spotted them 21 points in the first quarter. On the one hand, this is OK, I love it – when UGA loses, I am happy. On the other hand, there’s no need to actually kill somebody or paralyze him or anything. Somebody on EDSBS commented that Fairley would have had a lot of fines had it been in the NFL, and that’s probably true, so he’ll need to sort that out next year. Anyway, 4 years was enough, and we let them know it, good and hard. Let’s be happy with that. What a game. I’m now trying to recover from the CAO Brazilia I just smoked as a victory cigar. I need to stick to smaller cigars. Ones that take almost 2 hours to smoke are just too much. I don’t know what to say about all that happened in this game, yet. I’m sure I’ll work it out soon, though. I worry about Fairley’s rough play but Ga was chop blocking and holding from the start and if refs don’t control that stuff it’s no wonder that players like Fairley get frustrated and fight back when they have the chance. Just too bad that QB is the guy on the receiving end of the punishment. The game was out of control for most of the second half and the more dominating the AU defensive line got the worse it got. Walt, I almost always get tired of smoking them about a fourth of the way through. I feel ya. Re: Fairley; Every great defensive lineman, especially defensive tackle, has a game where they get called for some dirty play, because, frankly, that’s how they play. That’s what goes on in the trenches. Glenn Dorsey, Tyson Jackson, Terrence Cody, Marcell Dareus, and Drake Nevis all come to mind for having been called for dirty play, and that’s just in recent memory. Are they all thugs? Of course not. They’re all good defensive tackles. Man, the dog picture — what can I say! The pack of smokes on the hearth adds a nice touch! Im concerned. The dog looks violated. the QBs legs he goes…. What self-respecting guy wears white sweatpants? With white socks and black shoes? The one where Fairleigh was called for a personal foul was uncalled for–it was obviously too late and ended up costing 3 points and could have been much worse. The one at the end that caused the fight was nothing–UGA players started that fight but the Auburn guys should not have retaliated. Bama pic looks like it was snapped sometime during the second half of the sugar bowl against utah two years ago. Fairley pushes the envelope. You can look back at some of our close games like kentucky and he was getting PF calls on those. All I can say is if you’re going to do it and take the penalty make it a hit they’ll be thinking about for a while. The Incredible Bulk delivers everytime! How awesome was it when Dyer broke Bo’s record. I hope what happened on the sideline was shown on TV. If it wasn’t someone find or post a youtube video of what was on the jumbotron. THAT is Auburn Family. I will now refer to Dyer as “The Protege”. The crap at the end was unfortunate and unnecessary. Losing Blanc and Goggans will hurt, but even when emotions are getting the best of you you have to try and stay under control. I was glad that our bench stayed on the sidelines. When UGAs whole team ran out I thought it was about to go down. Time to celebrate, buy my SECCG tix, and get ready for a trip to T’town to watch the boys put 50 pts on the tahd. The biggest issue I have with Fairley is his celebrating. I’m amazed he isnt flagged at least twice a game for some of his stuff. As for the “dirty play” from Fairley yesterday, the only one that really bothered me was the one where he got the penalty that continued their drive that ended in the field goal (the one that snapped Murray’s head back). Driving a QB intothe ground on a tackle isnt the best thing in the world, but it aint exactly illegal in college football is it? The chop blocks and the play where the 3 OLmen were obviously head-hunting him that started the fight at the end of the game were far worse. You should go easy on that Bama girl in the photo. What is she, like 13? Pick on someone your own size. Say what you want, but Redneck Jesus up there is rocking the hell out of those white sweatpants. For what it’s worth, I think Auburn may move up to BCS #1 this week. I’m gonna wait for the standings to appear on some website because I cannot suffer through another BCS Countdown Show or whatever it is called. As for Fairley, as say feed that boy another bucket of nails and turn him loose. Off-topic: How do I add a photo by my name here? Yes, Fairley did hit him late on the personal foul. He was given a penalty for it as well. UGA chop blocked him and targeted him in the 4th quarter. Lord knows he smack talked, but he didn’t retaliate. End of story. One penalty does not define the player’s character. Why are the UGA-lies not complaining about the ejected players more than Fairley? B/c they were not the ones eating Aaron Murray’s lunch all afternoon. On the celebrating, yeah he could have been more subtle, but I think I have seen lots of D-line celebrations in my day (Honk if you sacked Brodie). It got the crowd going anyways. So who called the dog pile on Fairley that started the fight — Richt or the players in the huddle? About five people piled him including a fullback spearing him. Then Richt got all righteous. He deserves all the ‘necks of Georgia.